Looking to Sell your Used or Excess Cisco 2960X Series Switches? Look no further! NetEquity.com Buys and Sells New, Used and Refurbished Catalyst 2960-X Series switches. If you have recently upgraded your switching network, or have excess inventory of Cisco 2960X Series switches you are interested in selling, connect with a buyer agent today to receive a quote! Cisco 2960-X Series Switches are available in 24 or 48 Gigabit Ethernet ports with line-rate forwarding performance. These switches feature Gigabit Small Form-Factor Pluggable (SFP) or 10G SFP+ uplinks and FlexStack-Extended capabilities for out-of-the wiring-closet distance stacking of up to 8 switches with 40 Gbps of stack throughput. Cisco 2960X switches support FlexStack-Plus for stacking of up to 8 switches with 80 Gbps of stack throughput. Other features includes Power over Ethernet Plus (PoE+) support with up to 740W of PoE budget, 24-port PoE fanless switch for deployment outside the wiring closet and reduced power consumption and advanced energy management features. Administration features include USB and Ethernet management interfaces for simplified operations as well as application visibility and capacity planning with integrated Full (Flexible) NetFlow and NetFlow-Lite. NetEquity.com Buys and Sells Cisco Catalyst 2960-X Series Switching Products . If you are looking at Buying or Selling Cisco switches, we can help! Contact us today for a quote. 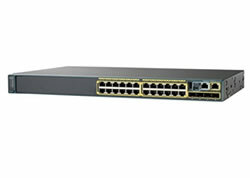 Interested in a price quote to Buy New or Refurbished Cisco Catalyst 2960-X Series switches? NetEquity.com stocks a large inventory of Catalyst 2960X models with competitive pricing discounts on both New and Refurbished Catalyst 2960-X products. In stock models including the popular WS-C2960X-48FPD-L and WS-C2960X-48FPS-L. To request a price quote, simply contact us or complete a quote request form online to get started. NetEquity Refurbished Cisco 2960-X Series Switches are professionally remanufactured to Excellent Cosmetic Condition, fully port and stack tested by Certified Engineers and reset to Factory Default settings. Our Refurbished Cisco 2960X Switches include Rack Mounting Hardware and Power Cord, and are ready to install out of the box. In addition to offering extremely competitive pricing on Refurbished Cisco Switching Products, we also offer a full 1-Year replacement warranty for End Users on all Refurbished Cisco products. We also maintain a very large standing inventory of the most popular Cisco Switch models and accessories, ensuring that we have what you need IN STOCK, with no long lead times. NetEquity.com wants to buy your used, excess or end-of-life Cisco 2960-X Series switches. If you've simply outgrown your Cisco Catalyst 2960-X series switches and are interested in a trade-in or upgrade, we can help. Contact us today to sell, consign or trade your unwanted Cisco 2960-X Series equipment.